Are you participating in the Eno Treelympics 2016? 1 Jan - 25 September 2016. Join and help to plant 100 million trees by 2017. The ENO Programme organises the 3rd ENO Treelympics, olympiads for tree planting. They will last from 1 Jan to 25 Sep 2016. Their target is to plant 100 million trees by 2017, a pledge they made for Rio+20 Summit 2012. Sign up to participate on their website http://www.treelympics.org/. Find their Facebook page to interact and tweet #enotreelympics. Africa needs more representation as shown in the map below! A more realistic estimation could be 1/10 of that including the loss of trees. And one cannot estimate the value of a carbon ton in a long run. But we can certainly make a difference, schools and children around the world! Let's join in and support Eno with this great project. Today I am giving a presentation at a school on how teachers around South Africa are using the newer Microsoft ICT tools in their classrooms and I thought I would upload it to Microsoft's OneDrive and share it in case anyone from the talk wishes to look up some of the links. I am embedding the PowerPoint from OneDrive here as well. One Drive is a great tool for sharing Microsoft documents online.
. This is an embedded Microsoft Office presentation, powered by Office Online. “When I started using computers around the year 2000, they were fun tools to set question papers, learners’ tasks and to type my personal assignments, CV, letters, etc. It was quiet fun for me to send and receive emails, to search information from the internet, to use Excel to draw and edit graphs, to perform a variety of calculations such as determining measures of central tendencies like averages, mean, mode, etc. It never crossed my mind then that there could be even more exciting things beyond using computers as tools. Today I say with no doubts that it is one thing to have access to technology and quite another to incorporate it into one’s day-to-day work, especially in the context of teaching and learning. "Since I started using Project Based Teaching, my teaching is renewed with the use technologies such as Skype, Office Mix, OneNote, Sway, YouTube, PowerPoint, Geogebra, Khan Academy, ixl.com, TED Ed … the list is endless. I create exciting digital materials and present my work to learners, teachers, parents and to an international community. This is very exciting experience and my colleagues and people who l share lessons with adore me for that! When they look at me and observe my lessons, they see me as the one at home with using technology in my teaching. My lessons look so neat, organized and more interactive than before. I share them with anyone who needs them as links anytime, anywhere and who can open them on any device that has Internet. Office Mix is one of the modern technologies that not only renews my teaching and learning but also develops learners' 21st Century skills. 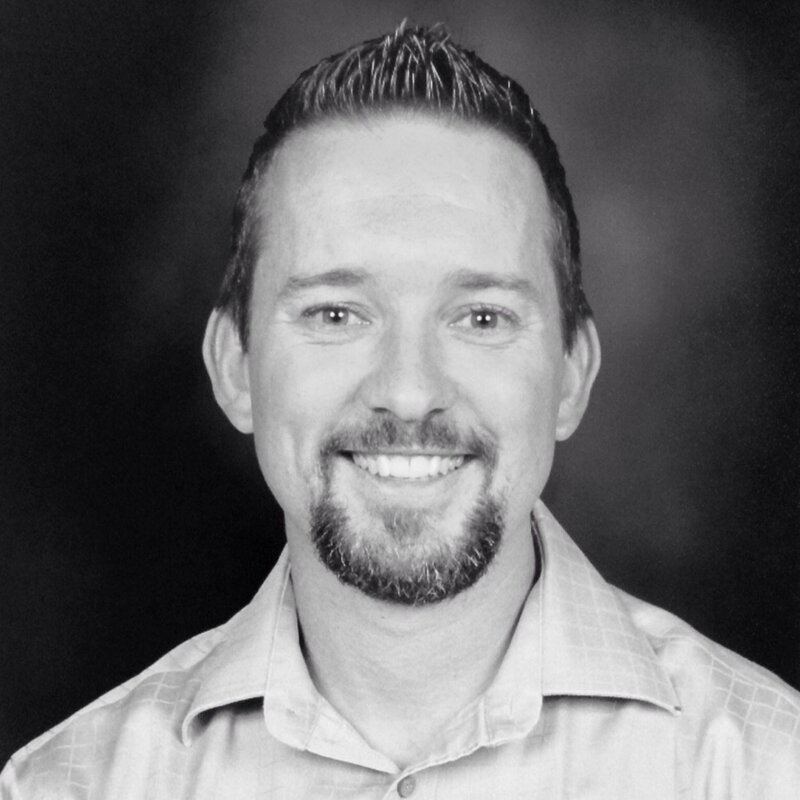 "I use Office Mix to flip my teaching and learning into a new experience altogether, I compare this to a new journey within the ones I used to take in the traditional way of teaching. This new and fascinating journey of journeys' begins with the use of my lesson plans which use PowerPoint presentations. It takes me about 15 to 30 minutes to create an Office Mix lesson. I simply use the lesson objectives as headings and thereafter include information, images and videos from Bing to make the presentations lively and interesting. To make them even more interactive and exciting I include quizzes, polls, exercises and lessons from Khan Academy, Geogebra and other Apps from Microsoft Lab for Office Apps. I trim videos and use only the parts I need. The added advantage of the self-made quizzes, other than educative purposes, is that they are context-based unlike ready-made quizzes from the Internet or other websites. I use context relevant to my learners. The lesson below is on Fractions and equivalence. A fraction is part of a whole, the whole can be one thing or a collection of things. To count fractions and decimals, learners have to count the intervals first. To find equivalent fractions two methods could be used; a fraction wall/drawings or multiplying/dividing both the numerator and denominator with the same number. To add/subtract fractions with unlike denominators, equivalent fractions can be used. To watch this Office Mix go to https://mix.office.com/watch/1wthryt6smq3j or click on the image below. "Teaching and learning has been made easier with this free add-in for PowerPoint 2013. The Office Mix video lessons are part of my resource-bank available for all learners; those who were absent from school as well as those who were present but would like to listen to lessons more than once and for revision and reference purposes. My lessons caters for multiple intelligence learning, and all types of learners are accommodated such as those who prefer to learn by hearing sounds, seeing, touching, reading, writing, telling stories , memorizing words and more. I encourage teachers out there to use this tool and experience this new experience." You’ll find the Office Mix website at https://mix.office.com/. Office Mix is a free add-in for PowerPoint and has everything you need to easily create and share interactive online videos. You can add voice, video & digital ink. 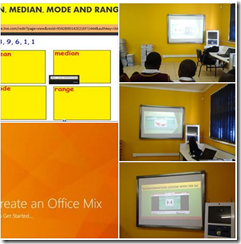 polls & interactive apps If you are keen to learn more about Office Mix take a look at this free Introduction Office Mix course on the Microsoft Educator Community. If you haven't yet joined the Microsoft Educator Community why not do so today? You'll be astounded at the wonderful, free offerings that await you! Google Photos #2: The good, the bad and the ugly! Google Photos is a photograph and video sharing and storage service by Google. It was announced in May 2015 but recently it has come under the spotlight as Google is retiring the ever-popular Picasa web albums in March 2016. All the albums stored in Picasa will need to be moved (if Google hasn't already done it for you) to Google Photos https://photos.google.com/. While this is all exciting, new and fresh, there is one problem that is causing many a headache! The Google crew have made some photo stories with my photos and added GIFS here and there. You can open a collection (album) and move photos around within that collection. The main problem that comes up on all the forums is that there doesn't seem to be a way to organise all of one's albums in chronological order. This is a real problem and I am wondering if Google will give an update for this at any stage! I have searched the Internet for answers to this problem but haven't found an answer yet! Most of my photo collections are stored on Google's Picasa. Now I hear that in March 2015 Picasa will be no more!!! Help! So today I am researching Google Photos. The Google Picasa blog says: "We’ve decided to retire Picasa over the coming months in order to focus entirely on a single photo service in Google Photos. We believe we can create a much better experience by focusing on one service that provides more functionality and works across mobile and desktop, rather than divide our efforts across two different products..." The date is March 15th. When did Google Photos start? The official Google blog says in a post entitled, 11 things to know about Google Photos "Google Photos was created in May 2015...we wanted to make all these experiences even better—with unlimited high quality storage so you never need to worry about where to store your snapshots, automatic organization and great search so you can quickly find the photo you’re looking for, and easy sharing so you can send any photo to anyone with just a link." This sounds amazing! By October 2015 100 million people were using Google photos! Google says, "With Google Photos, you can now backup and store unlimited, high-quality photos and videos, for free. We maintain the original resolution up to 16MP for photos, and 1080p high-definition for videos, and store compressed versions of the photos and videos in beautiful, print-quality resolution. For all the storage details, visit our help center" (it is worth clicking on this Help centre link). How do I find Google photos? https://photos.google.com/ and there you have it! How do I automatically back up photos from my mobile phone? I discovered that it is best to download the Google Photos App. from the Google Play stores (for Amdroid) or iTunes (for iOS). You can then set your phone to automatically upload photos that you take whenever you are using WIFI. Learn how to use Google Apps for Education and other technologies to enhance your teaching in engaging sessions led by Google Certified Innovators and Trainers and local GAFE rockstars. Sessions will cover a wide range of applications for beginner and experienced GAFE users, for classroom teachers, administrators, tech coordinators, and anyone interested in learning how Google's free suite of tools for education can enhance student learning. 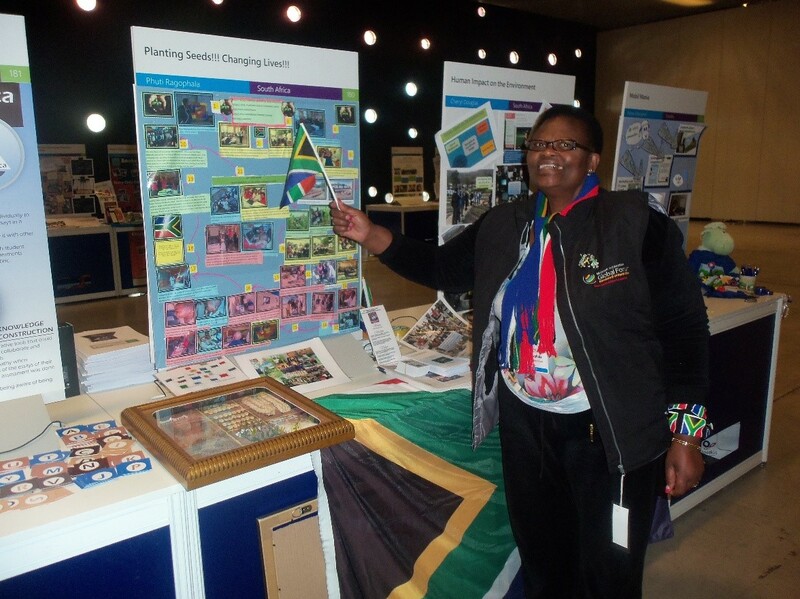 This is the sixth post in the series "MIEExpert Spotlight for South Africa". The tab with all the posts can be found at: http://bit.ly/1ZYy8Z7. Today we focus on Phuti Ragophala, the principal of Pula Madibogo Primary School in Limpopo. 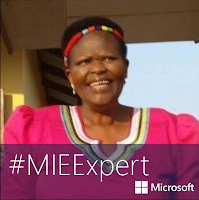 Phuti is in her third year of being selected as one of South Africa’s Microsoft Innovative Educator Experts. Last year she was selected to attend the Global Forum in Dubai to interact, share with and learn from innovative teachers from other countries. She was also selected by Microsoft to attend the Global Forum in Barcelona in 2014. These professional development events have grown Phuti’s professional network to include teachers throughout the world. In fact, one teacher from the USA who Phuti met in Barcelona was so moved by Phuti’s description of her learners that she arranged for books to be donated to Pula Madibogo Primary and has conducted Skype reading sessions with the learners. 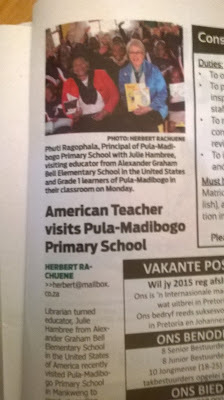 The same teacher, Julie Hembree has traveled to South Africa especially to visit Phuti at her school. 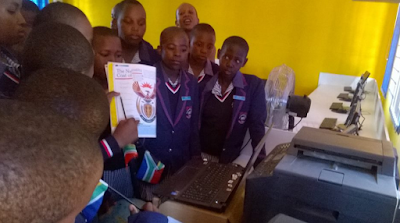 Phuti says that from the Microsoft in Education Forums “I have learnt how technology should be used as a supporting tool and an educational booster to assist the teacher and learners to meet the objectives of a lesson”. 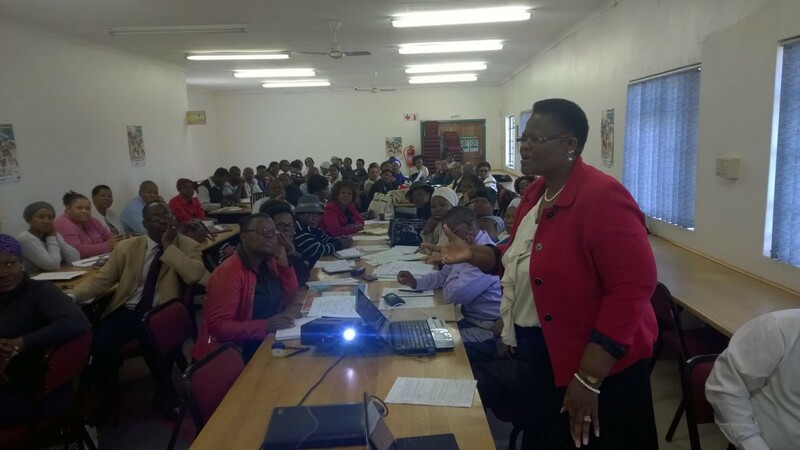 Phuti not only encourages learners to make use of technology, she inspires the teachers at her school to do so too and has collaborated with colleagues to produce joint learning activities that encompass different learning areas. Phuti is very active on social networking sites. You can find her on Twitter at @PhutiRagophala sharing with others whatever she has created or inspiring others with her comments. 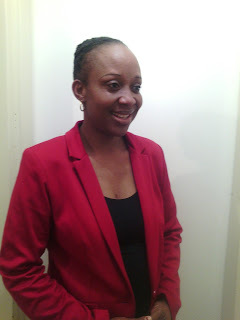 She is well-known for the lovely Microsoft Sways that she creates on a variety of topics. Phuti also holds regular skype meetings with teachers and classes from other parts of the world. Although she is the principal, and nearing the age of retirement, Phuti still plays an active role in teaching. She says, “I am an educator who does not follow prescribed teaching preparation from text books. I only get the theme for that week and come up with my own approach supported by websites, experience and learners inputs. Every year my approaches differ.” Phuti continues, “I am inspired by Microsoft’s commitment to empowering the youth through education and improving youth employability and entrepreneurship through digital inclusion, creativity and innovation.” In her own way Phuti is as committed to achieving these same goals for learners at Pula Madibogo Primary. You’ll find the Sway website at https://sway.com/ You can create and share interactive reports, presentations, personal stories, and more. If you are keen to learn about Sway – check out this free Introduction to Sway course on the Microsoft Educator Community. If you are a teacher who likes to be innovative in the classroom, think about entering Microsoft's Innovative Teacher MIEExpert program in 2017 when applications reopen later in the year. You can learn more about the program at this link: http://bit.ly/1H4gKcB on the Microsoft Educator Community. You won’t regret it! One Drive is a free Microsoft application that gives you free access to a range of Microsoft Office products. Have you registered for One Drive? https://onedrive.live.com You'll receive 5GB of free storage. 3. Locate your PowerPoint and upload it to One Drive. 4. Share it so that anyone with the link can view it. First click on Get a link, then select View only and finally create the link. Microsoft's One Drive is amazing! For more lessons on how to use Microsoft in the classroom visit the Microsoft Educator Community at: https://education.microsoft.com/ and go to the Lessons page where you can search thousands of lesson plans created by educators for educators to help enhance teaching and learning. The Computer Olympiad (http://www.olympiad.org.za/) has announced its new talent search for 2016. This is a great free contest for schools to consider. Talent Search is a free contest to develop Computational Thinking; the kind of skill you need to take IT, CAT, Maths and Science. At the same time it will identify learners with potential. That is why many schools use it for subject selection. Entry is free – all the costs are paid by sponsors. Grades 6 and 7: Learners who do well are encouraged to apply for high schools that offer IT, CAT, Maths and Science. Certificates can be included in the application. Grade 10 to 12: Learners who do well should consider further studies or careers involving Maths, Science, IT and CAT. No marking at all if using the online version. Simple, quick marking when using the off-line version. Learners who achieve better than average will receive certificates to add to their CVs. The contest itself is 45 minutes and can be done any time in the week from Monday 7 March to Friday 11 March (both dates inclusive). Registration is free. Schools can register directly at http://www.olympiad.org.za/register-talent-search/. This is a message from Vidcode. It brings with it some great opportunities for teachers and classrooms in 2016. In our technology-driven economy, an understanding of programming is critical to students’ success in whatever they decide to do. Read this story about a Biology teacher using cross-curricular coding integration to engage students and empower them to share their work. Hour of code projects for you! Are you ready to empower your students to learn to code? Vidcode offers two Hour of Code projects to get you started, one that’s perfect for your science classroom, and one that will fit right into a video production or art class! You’ll also find off the computer activities and teacher resources in our Tech Jam / Hour of Code section. These activities are a great way to integrate learning to code into your classroom! Still have questions about CS for All, how to get involved, and how to teach computer science in every subject area? Reply to this email, or send a message to leandra@vidcode.io." Top achievers: meet the 2015 ISPA SuperTeacher Competition winners - 2016 competition launched! Guest post submitted by Sharon Ries of CozaCaresDigital Learning Day is being celebrated across the United States today, Wednesday 17 February. Other countries around the world have been encouraged to submit information about their events today as well, on the Twitter handle @OfficialDLDay and the hashtag #DLD. CoZa Cares Foundation is choosing to launch the 2016 ISPA SuperTeacher Competition on this day - and so a little balloon will be featured over Johannesburg on the DLD map of the world as shown below! 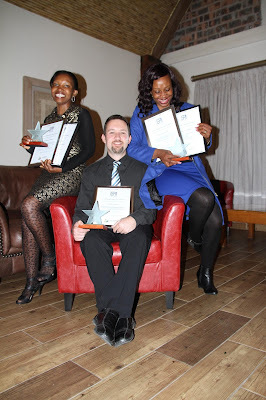 The three winners of the 2015 ISPA SuperTeacher Competition - Mabore Lekalakala (ISPA ChampTeacher category), Matthew Haines (ISPA TechTeacher category) and Tinny Molepo (ISPA SuperTeacher category) - each received fabulous prizes sponsored by Mustek Ltd and CoZa Cares Foundation. Mustek generously sponsored state-of-the-art eBeams and a Beng E5500 Digital Projector for each winning teacher while CoZa Cares sponsored their attendance at any conference of their choice in South Africa in 2016 where they can present their projects to a wider audience. The glittering gala dinner awards ceremony for the 2015 ISPA SuperTeacher Competition took place in Stellenbosch. The Provincial Minister of Education, Ms Debbie Schäfer, was guest speaker and presented the prizes. Enter the 2016 ISPA SuperTeacher Competition http://www.cozacares.co.za/competition-2/ today! In 2016, the ISPA SuperTeacher Competition Gala Dinner Awards ceremony is planned to take place in Johannesburg during iWeek in September. For some time now I have been interested in getting to grips with creating 'Hyperdocs'. HyperDoc is a term used to describe a Google Doc that contains an innovative lesson for students - a 21st Century worksheet and more. The name was penned by Lisa Highfill and Sarah Landis. It's all about hyperlinking your docs for amazing learning experiences! With one shortened link, students can access a lesson that contains instructions, links, tasks, and more. So when I came across @cogswell_ben's superb Google Cheat Sheets I realised that these are excellent examples of Hyperdocs. Ben has kindly given these a Creative Commons license so that they can be reused. One can't embed them but if you click on the images below you'll be taken to the originals. SchoolNet SA would like to congratulate the three South African and Lesotho Microsoft Innovative Educator Experts for 2015/2016 who have been selected to attend the Microsoft Global E2 Teacher Exchange in Budapest next month. They will join and network with 300 MIEExperts from around the world at this exciting event. Who are the three South African teachers that have been selected? This selection was very difficult for the judges to make from the current 63 MIEExperts. Angela Schaerer from Microsoft said, "The three teachers chosen have demonstrated a willingness to support their peers and share their expertise through a variety of platforms; have showcased some very innovative work in the classroom using technology to enhance learning; and importantly, have continued to develop themselves through the resources available on the Microsoft Educator Community." If you are a teacher who likes to be innovative in the classroom, think about entering Microsoft's Innovative Teacher MIEExpert program in 2017 when applications reopen later this year. You can learn more about the program at this link on the Microsoft Educator Network: http://bit.ly/1H4gKcB You won’t regret it! The DG Murray Trust (DGMT) invites proposals for experiments that tackle school drop-out in South Africa. "We invite you – as well-known organisations in this field, or fresh new alliances - to design and implement a programme focused on identifying Grade 8 and/or 9 learners who are at risk of dropping out and putting in measures that reduce the rates of grade repetition and drop-out. The project will be implemented over a period of 36 months through a phased approach. We are looking for proposals that make a strong and compelling case as to how the proposed strategies get to the heart of the challenge of school drop-out in South Africa. We would like to see crisp and different ideas, connecting people and resources in unusual ways. At the same time, we recognise that sometimes what is missing is just good implementation of well-established solutions. Proposals will be reviewed with an eye to cost-effectiveness at scale." DGMT invites interested parties to read the supporting Terms of Reference. For further queries, contact Chiara Baumann at chiara@dgmt.co.za. The deadline for proposals is 29th February 2016 @ 11:00. Learning to read is one of the most important things a child will learn at school. Everything else depends on it. The best is to teach reading in such a way that children love it and they want to read for themselves. 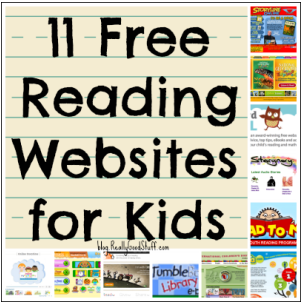 Free reading resources are always a teacher and a parent’s dream but of course, these are few and far between. In this post I will tell you about some of my favourite free sites. I have only just discovered this free website and it is a treasure box. The website the website actually has a lot more than only ebooks! Really, if you are a teacher or parent of primary school children take a look at this site. It is the home of 350 tablet-friendly eBooks and activities, including the free eBook library and the two new eBook collections: Project X Alien Adventures and Oxford Reading Tree inFact. The site is easily searchable by age, level and genre, the eBook Collection is designed to help you find the perfect book for every child. 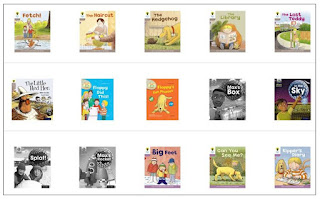 You can share the eBook Collection with all your students by creating a class login. Using the same simple username and password, every child can log on at school and at home. 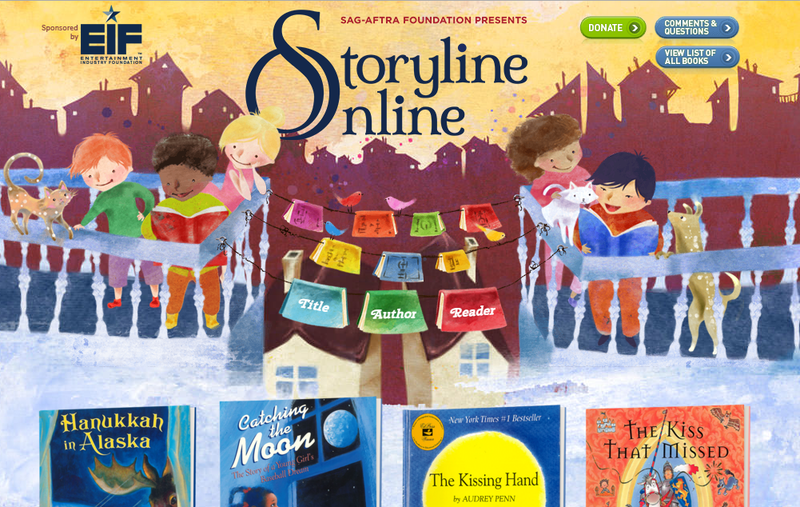 Developed by The Screen Actors Guild Foundation, Storyline Online features accomplished actors and actresses reading some of their favorite children’s books. Each story comes with a free Activity Guide and can be viewed on YouTube or SchoolTube. Rainbow Fish, Wilfrid Gordon Macdonald Partridge, and To Be a Drum are just a few of the books available. 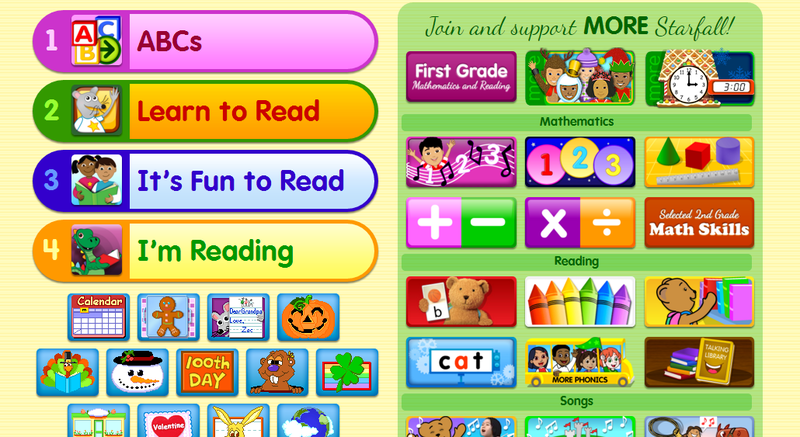 My students LOVE this site. 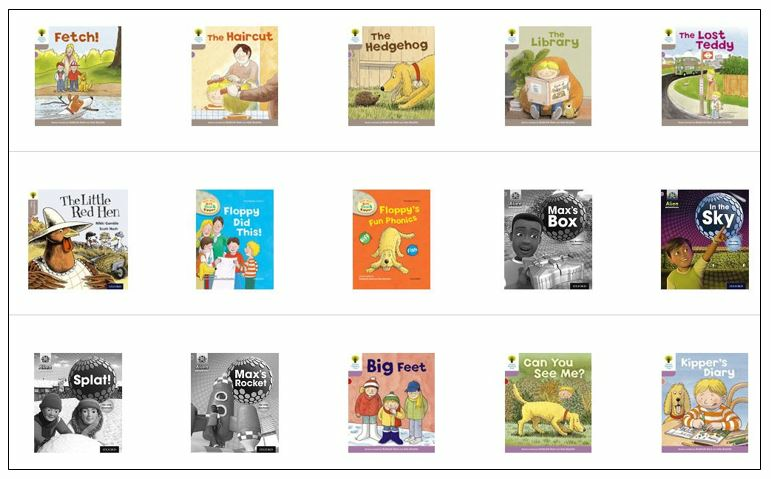 While some areas of Starfall are part of their premium service, they have many early reader stories that are available for free. Students can follow along as the story is read to them and they can , in some places help create their own story. The website is very engaging especially with younger students. 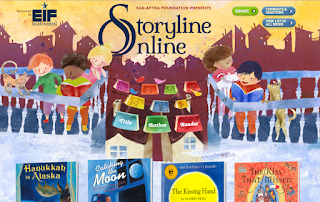 The African Storybook Project is a wonderful Literacy website with a wide range of stories from Grades 1-3 learners in a multitude of African languages. Visit www.africanstorybook.org to see the amazing spread. The stories and folktales have beautiful illustrations, can be read online or they can be downloaded as PDFs and made into hand-held books. Best is that the African Storybook Project is OER and uses Creative Commons licensing which enables the books to be adapted if so desired. This is one of my favourite South African websites of stories for Grades 1-3 students throughout Africa. 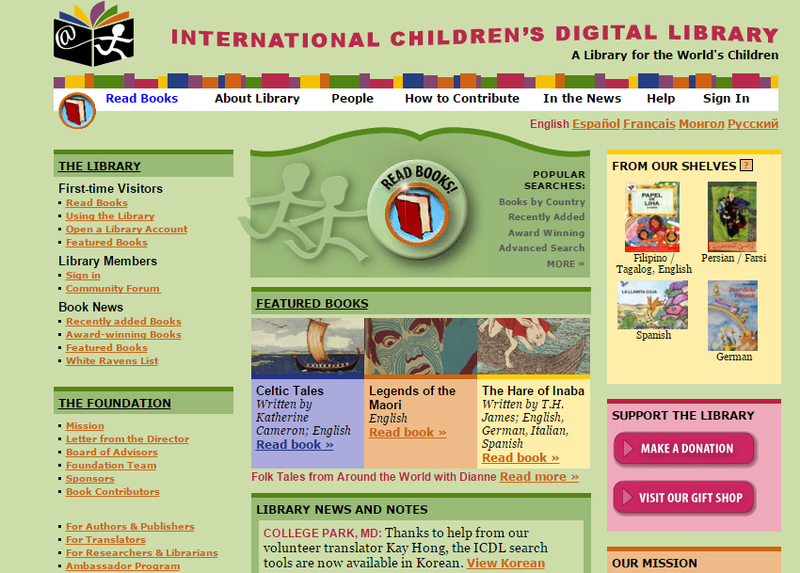 You can discover books from around the world at the International Children’s Digital Library. 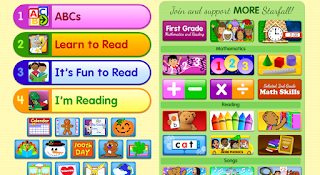 The free site does not read the books aloud, but students can read them independently. This is also a great site for extension activities when learning about different regions of the world. Storynory is a free site that features a collection of original, fairytale, and classic children’s audio stories. Students can follow along with the story as it is read to them, as the text is also included on the site. There are also some great features available that give you the option of downloading the audio to your computer, listening to “catch phrase” explanations, translate text into different languages and more. 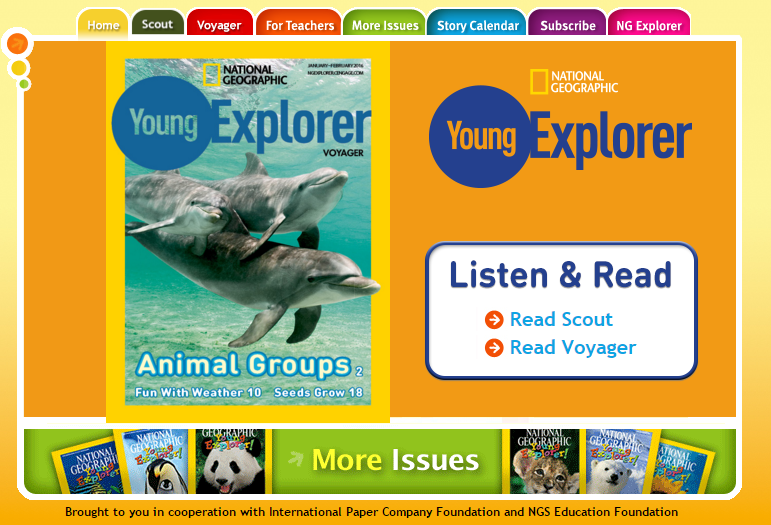 National Geographic Young Explorers is a magazine designed specifically for Grade R and fGrade 1 students. 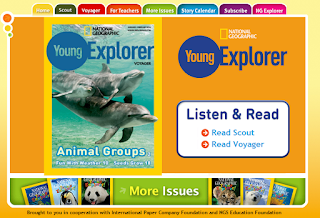 Children can listen to the magazine being read to them online as they follow along with the highlighted text. It is a great way to read beautifully illustrated and interesting non-fiction stories. This post has a collection of 11 free reading sites. Some of them may overlap the ones above but it is a post well-worth exploring. Reading Bear is a fun way to learn to read. They teach over 1,200 vocabulary items. They also have 50 presentations cover all the main phonics rules. All of these are free. One of my favourite sites is Jacqui Murray's Ask a Tech Teacher site. Jacqui posts really interesting posts every day. 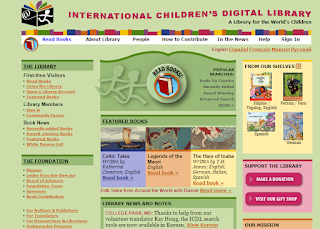 She also has lovely collections of websites on her site; and one of these collections is a reading site collection of great reading websites for students K-5. DO visit her site. With so much wonderful material available on the Internet one can see the benefit of getting all schools connected as soon as possible.